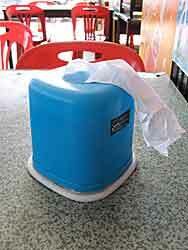 Do Thai napkins differ from napkins in other countries? One of the things I love about traveling outside of my own country is the chance to see a different culture; not just in the sense of museums and that sort of thing, more in seeing the day-to-day activities of people. It’s a wonderful opportunity to have my own notions of “the way things are” and of “common sense” to be gently (sometimes not so gently!) challenged. On Kasma’s trips to Thailand, one of the smaller and more challenging opportunities to examine one’s pre-conceptions comes from Thai napkins. In the United States, napkins are typically large, sturdy affairs; typically placed on the lap and able to handle just about anything from wiping a glob of gravy from your mouth to protecting your lap from spills. 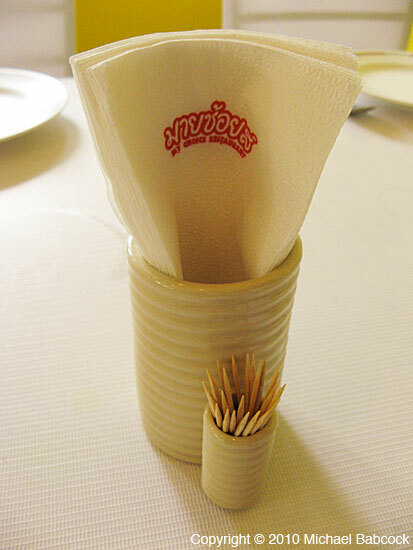 In Thailand, napkins tend to be very small and very flimsy. Often trip members look at them with disbelief: “I’m supposed to use THAT as a napkin!!!?? ?” Often, laughter ensues. Only very occasionally will you get a napkin closer to the U.S. ideal, typically in more expensive restaurants that cater to westerners. 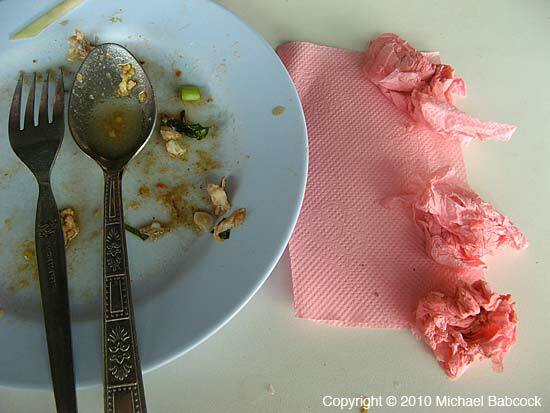 The Thai idea is that each napkin is used once and discarded. I imagine Thais regard our huge, multi-use napkins as rather disgusting. Why on earth would you want to re-use a napkin that was dirty from a prior use? Yuck. Westerners invariably end up using multiple napkins at a meal, as the small papers are exhausted one after the other. You can tell a particularly spicy-hot meal because the sides of plates are littered with all the napkins used to wipe faces, sweaty from the chillies! On the other hand, the Thais I come in contact with use very few napkins at a meal. Our driver, Sun, even at the spiciest-hot meal, may use only one: and that is to wipe his plate and silverware before the meal. My own impression is that Thais are simply neater than fahrangs (their name for westerners). If used correctly, their way saves a lot of paper waste. 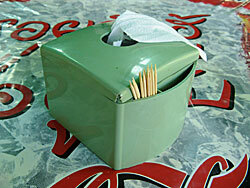 Last year in Thailand I took a number of pictures of typical Thai napkins and their dispensers. 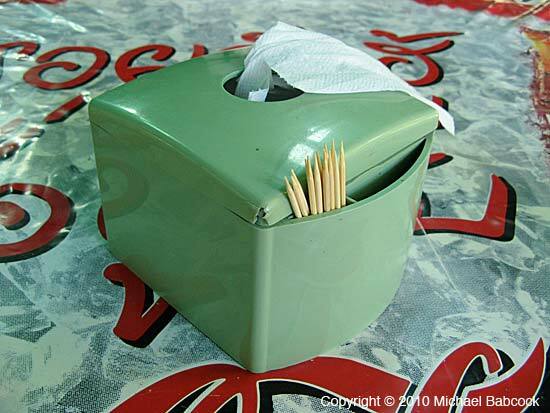 The quintessential napkin dispenser will also have a place for toothpicks. 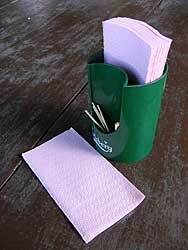 Another option for napkins is a roll of toilet paper, such as the second picture at the top of the page. 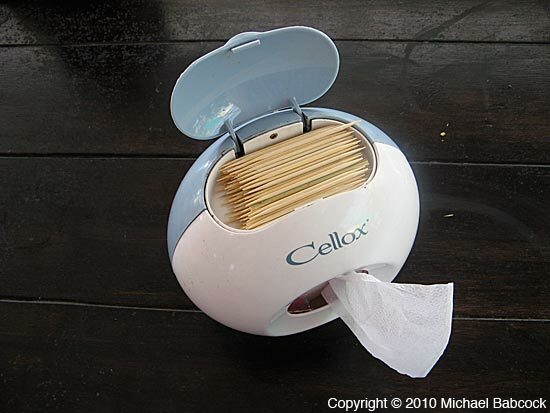 One simply pulls out tissue as needed. Toilet paper dispensers for the table are often decorated and elaborate: I’m sorry the only one I can offer is a bit plain. You’ll find such napkins and related dispensers as described at street stalls as well as many storefront and even somewhat more upscale restaurants. I’ve included above left a picture of a somewhat fancier (although still remarkably flimsy, by U.S. standards) napkin with the name of the restaurant imprinted: it’s from one of our very favorite Thai restaurants anywhere, My Choice in Bangkok. This entry was posted on Saturday, June 5th, 2010 at 12:05 am	and is filed under Thai Culture. You can follow any responses to this entry through the RSS 2.0 feed. You can leave a response, or trackback from your own site. Hi, just stumbled upon your site. Like you, I am amazed at the way different cultures present and manufacture items, napkins in this case, based on what traditions are. The company I work for provides personalized napkins and custom printed napkins mostly for the hospitality industry and we’re always looking for new ideas. Thanks for your post, and the Thai education :). Will be checking out more of your pages having to do with Thai food, which I love.